Stone Veneer has been around since The Roman Empire, however, since the late 1800’s it has steadily grown in popularity. Today, it is one of the most popular siding choices for homes. Stone veneer siding gives your home a makeover that will transform the exterior of your home and improve its curb appeal. Why Choose Stone Veneer Siding Over Alternatives? While wood, vinyl, stucco, and other options are quite traditional and popular choices (mostly due to cost), none can compare to the aesthetics, quality, durability, ease of maintenance, and value of natural or manufactured stone veneer. Here are several reasons why we have grown more accustomed to seeing homes with stone veneer siding. Stone veneer siding offers a beauty that rivals all others, except natural stone of course. That being said, stone veneer siding comes at the fraction of the cost of natural stone. The texture of stone veneer instantly gives a home a great sense of character and visual appeal. There are several varieties of design and colours you can choose from that will work to your homes’ advantage. Stone veneer siding is lightweight compared to natural stone yet, it is still incredibly durable. When maintained properly, for the lifetime of a home. When converting your current siding to Stone Veneer, it’s an opportunity to upgrade your home’s protective envelope with rigid insulation. Thereby increasing the R-Value significantly. You could save hundreds in energy costs each year by using less heat in winter and less cooling in the summer. Maintaining and keeping your stone veneer siding requires an annual spray with the hose. Unless you notice damage, or a rare structural flaw, there should be little to no maintenance required. According to a 2015 report by Remodeling Magazine, homeowners can expect to recoup 92.2% of the cost to install stone veneer. We previously featured stone veneer siding as one of our top 5 home renovation projects to boost your home’s value. A home with stone veneer siding is far more likely to gain the interest of prospective buyers compared to other homes. 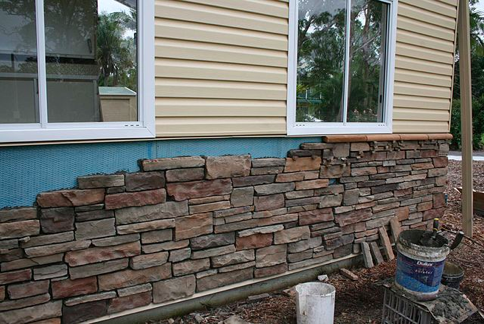 Natural stone veneer siding is made from natural stone that is either picked ie. fieldstone or quarried. Stone Veneer is made a maximum of 1” thick and is approx. 15lbs per square foot. Manufactured or Cultured stone veneer is made by mixing natural stone with a lightweight concrete as well as other components, it’s poured into ‘stone shaped’ rubber molds, then colour is added to give it a realistic stone appearance. Installation is generally easier than natural stone veneer, thus lowering installation costs. Stone veneer is an excellent choice for several applications in your home. For the exterior - it gives your home a grand statement at a fraction of the cost of natural stone. For the interior – stone veneer is great for fireplaces, backsplashes in the kitchen, raised gardens, column wraps, the only limitation would be your imagination. We know that your home would benefit with the addition of Stone Veneer, especially when installed by a home renovation expert. To get a better understanding of how it will look, contact the experts at Bryant Renovations today.